Normally stories about city-council dress codes (or at least the ones I notice) involve audience members refusing to wear pants, but this one is about a councilor who won't take off his mask. 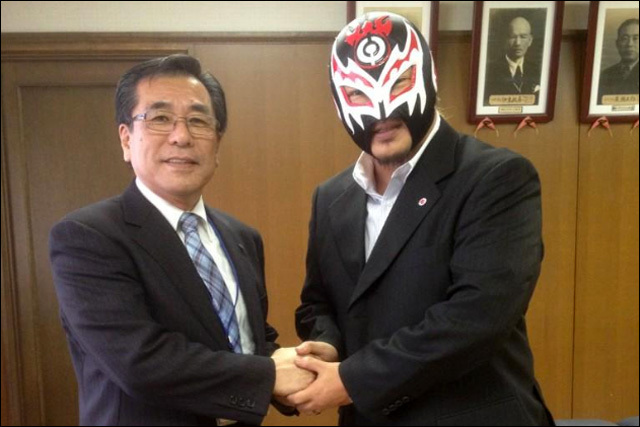 Skull Reaper A-ji won a seat on the city council of Oita, Japan, in February, but was not allowed to attend initial meetings last week after refusing to remove his lucha-libre-style wrestling mask for that purpose. According to one report, the majority decided that allowing a masked city councilor would "offend the decency of the Assembly," which sounds like something they just made up because they're not wrestling fans. Another report said the majority cited a rule providing that "a person taking the floor shall not wear items such as a hat." If that rule exists and applies to everybody, that might be different—I'm having trouble thinking of a reason that a wrestling mask would not be an "item such as a hat." 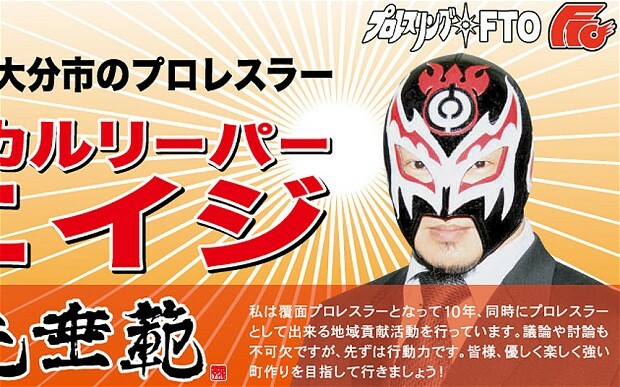 A number of politicians who choose to wear wrestling masks have been elected at the local level in Japan, including a councillor who goes by the name Super Delfin in Osaka and the former professional wrestler The Great Sasuke, who was elected to represent Iwate Prefecture in 2003. "Skull Reaper" is, if anything, more awesome than those guys. But unless the majority has changed its view during the last week or so, he remains shut out of council meetings. Unless he has changed his own view, that is, and agreed to unmask. As of last week, he was standing firm. "If I take my mask off, I'm an entirely different person," he said, although in fact he would be the same person, just not wearing a mask. Still, "I will not take it off," he insisted. At last report, the stalemate had not been resolved. These reports don't make it clear whether Skull Reaper A-ji is or has ever been a real wrestler, or if he just likes the masks. There is no suggestion that he is somehow dangerous or prone to violence, and in some legislative bodies that sort of thing might actually come in handy anyway. Give the people what they want. Or what 2,828 of them wanted, at least.